Universal Coins Mod provides tools for you to trade any items using coins., which come in four values: the Coin (value 1), the Coin Stack (value 9), the Large Coin Stack (value 81) and the Coin Pile (value 729). Obviously, 9 of a lower tier will get you 1 of the higher tier; also 1 of a higher tier will get you 9 of the lower tier. 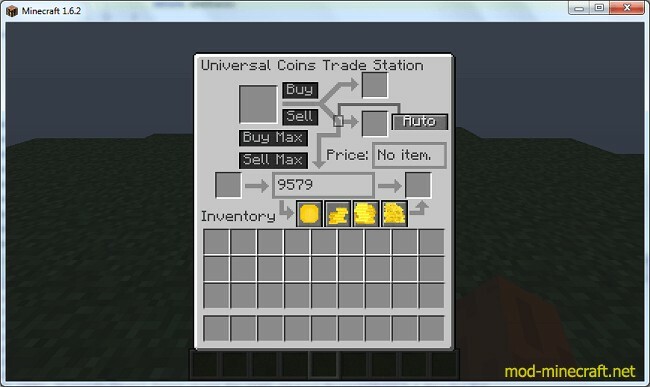 The trading is done at an Universal Trade Station. 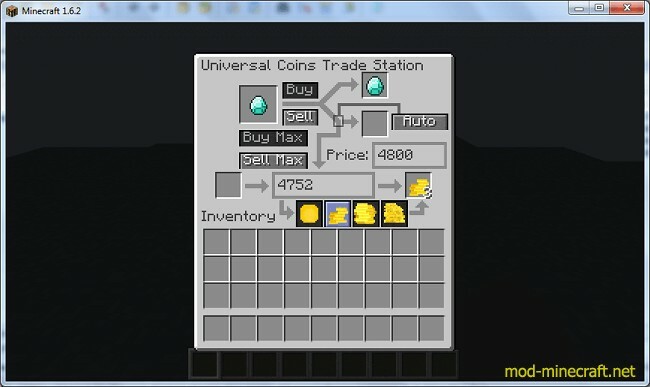 The only way to get coins is by selling an item. Most vanilla items have a predefined price and prices can be changed in the config file. Items can only be bought after the player has found at least one of that item (no buying blaze rods before finding one). Put an item in the larger slot (top-left) and you can see its price. Press ‘Sell’ to sell the item. 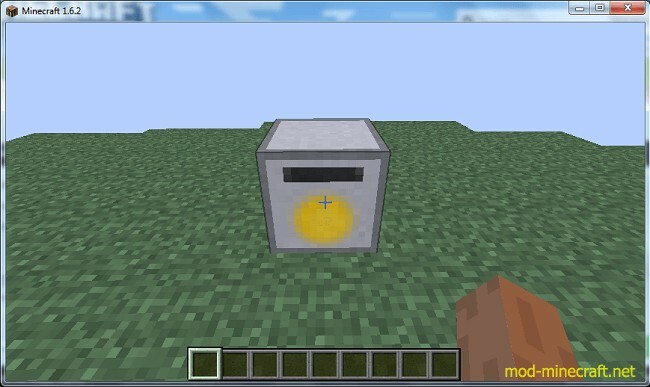 The coins will appear in the corresponding slot. 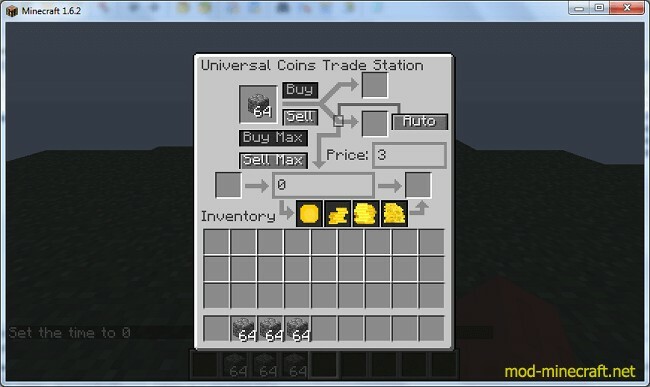 Take the coins from the output slot and put them in the bottom-left slot to add them to the station’s internal coin amount. The shown sum will increase. To skip the ‘moving the coins’ step, you can press the ‘Auto’ button to automatically move the coins to the internal buffer. When selling the item, the coins will appear directly in the amount. 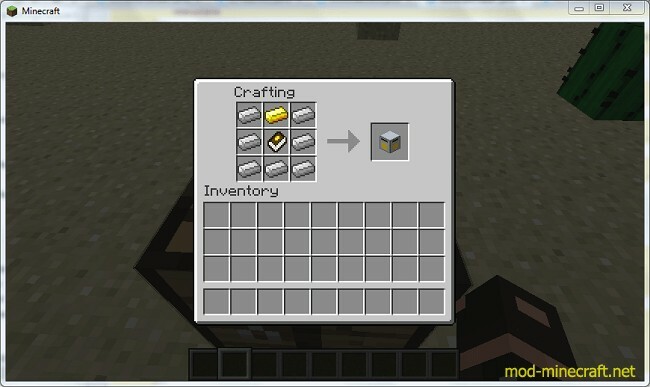 To buy the items, first place one (or more) of the item you want to buy in the top-left slot. By pressing ‘Buy’, the price is deducted from your coin amount in the buffer and you get one of the item you bought. 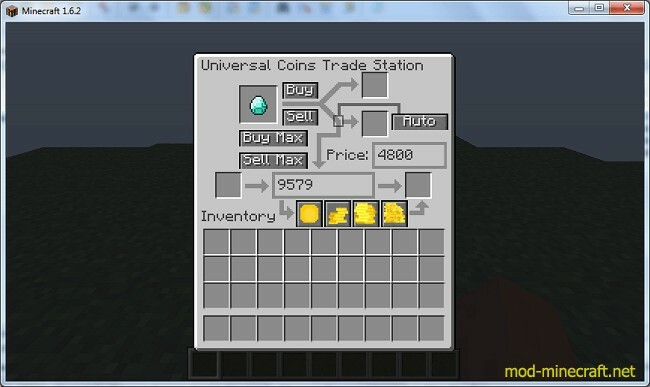 If you ever want to retrieve the coins from the internal coin buffer, press the buttons on the bottom. The coins should appear in the bottom-right slot for you to pick up. To save a bunch of clicks, you can press Buy Max or Sell Max to buy/sell as much as possible with only one click. By pressing Sell Max, the whole stack is sold with only one click. Buy Max works in the same way. First, you’ll need a Selling Catalogue. It is only used as a crafting ingredient. Then, craft yourself the Trading Station. 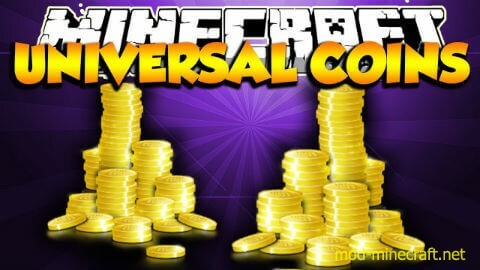 The pricelist files are located in the config/universalcoins folder. Each mod has a separate file in this folder. Blacklists have been removed. To disable buying/selling an item, change the price to -1. If you want to help set the default prices for a mod or you feel that a price is wrong, change it and please let me know why you think it’s wrong.